We are in the middle of what is probably the best season of Lee Vining Ice in recent memory. There's been a flurry of new and potentially new route activity. 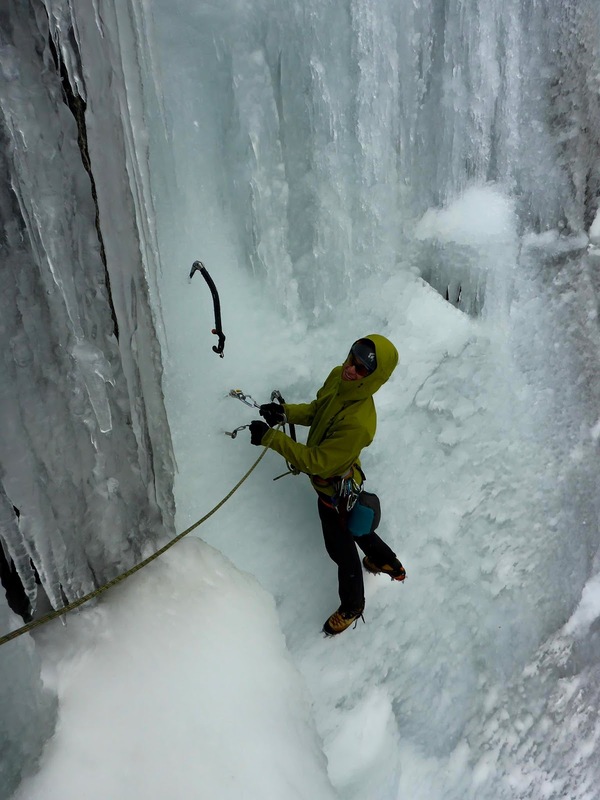 I've only been swinging tools in this great little venue since 2009, and there are local folks who've been climbing ice here much, much longer than that, but everyone seems to agree that we are having a great winter for water ice. For me it started with a trip into the canyon with Alyssa Krag-Arnold at the end of November. Some years this is just a scouting mission, but Chouinard Falls was in coming in really well for so early in the season. 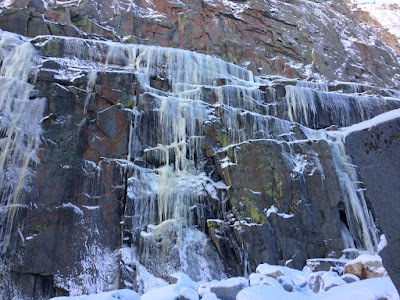 At that time of year some discretion and restraint is required on the part of climbers to not slow the development of the ice, but we had a good time nonetheless. Alyssa catching an early season lap on the Tree Route. On our way out Alyssa indulged me with a belay up the right side of a short pillar in the Narrows I had been looking at. The left side of this pillar is the first part of a two pitch route established by SP Parker and Urmas Franosch. The right side was definitely unclimbed, as I trundled a few choice pieces that day (and a few more on a subsequent ascent). The route starts with some fun edges and hooking, and finishes with a bit of chimneying. Alyssa was patient as I cleaned off snow that had blown into the corner in a few places. At the top, it was a luxury to clip the anchor SP and Urmas had left and lower off. In the spirit of the other Star Wars - themed routes in the area I christened it TK421. Since it goes at about M3 and protects well from good stances it makes a good warm up for the area and for trad protected mixed climbing in general. I had another good day in the canyon ten days later with Kevin Normoyle, and then hiked in with local legend Doug Nidever. We had heard that Spiral Staircase was in. This is probably the easiest route on the Main Wall and hasn't formed in 5 or 6 years. The route used to have a bolted anchor part way up, but a few years ago Christy McIntire posted a photo on Facebook of those anchors (and a big piece of granite they were still in) on the talus below the cliff. Despite a light drizzle Doug and I were excited to see what the route was like now. The pillar that had been the centerpiece of the route was forming as a thin curtain, which Doug cruised. Above where the old anchors used to be a fat column was forming, but it was way too wet for enjoyable climbing that day. Yours truly about to traverse over to the thin curtain. It's a rare day when I climb in my Gore-Tex! Photo by Doug Nidever. A week later I was guiding a winter ascent of Mount Whitney when I received an email from Luke Lydiard. 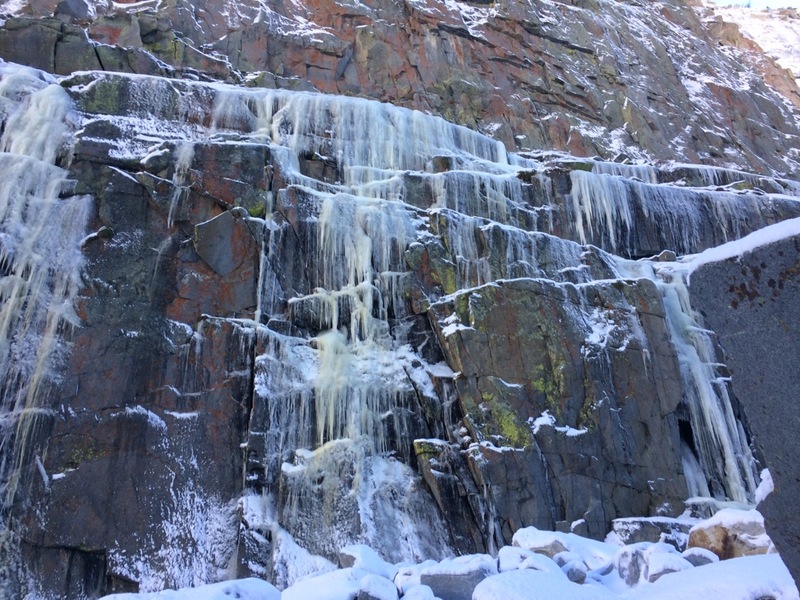 It was a forwarded conversation with visiting climber Chris Wright about an ice route he had climbed on the left side of The Narrows. At first I assumed he was referring to Zippo's Frozen Booger, the only pure ice route I knew of there. Upon looking at the attached photo I was shocked. There was Zippo's on the left side of the photo, but in the center was a formation I had never seen before. I'm not proud to say that I immediately felt some FOMO. I wasn't jealous of a visiting climber scooping a probable first ascent (in fact, I was psyched that our little playground was getting some attention) but I wanted to climb that thing, and it looked so ephemeral that I doubted it would still exist when work and life gave me a chance to get in there. A FOMO inducing photo, Womp Rat in the center. Taken on December 19 by Chris Wright. A little over a week later my wife and I hiked in hoping that the route in question, which Chris dubbed Womp Rat. As a photo on Mountain Project shows, it wasn't particularly fat when Chris climbed it, and by this time it had sublimated sufficiently that I didn't think there was enough ice for me to climb. With a sigh, we hiked up to Spiral Staircase for a look at the new column. It had turned into a steep curtain, and it was dry, and there was a sweet belay cave behind it! The cave was big enough for at least 3 folks to hang out comfortably, and exiting it onto the curtain reminded me of Louise Falls in the Canadian Rockies. On the last day of 2016 Luke and I hiked into the canyon for some mixed climbing. Our warm up was 30 Seconds Of Remorse, a route I hadn't been on since it was put up. This time around the first 30 feet was legit ice climbing, and I didn't remember much of anything about the cool crack that makes up the meat of the route. I'm claiming an Alzheimer's-point. The tat Jed, Thomas and I left on the juniper at the top had been chewed on by some animal, so there's some new cord now. Before moving up-canyon we stopped for a couple of cool little daggers up and left. The left side of the Narrows is bounded by a small gully feature. This had a little pour-over at the top that was sporting a pair of offset icicles. The route opens with a bit of mellow ice, and then Luke pulled out of a cool rock cave onto the first dagger, and made a delicate transfer onto the second. This little pitch is pretty fun and fairly unique to the area. Before the solstice there's probably not enough moisture for it to form and come mid to late season the whole gully fills in with snow. Like it's namesake, Jawa is a curious and unpredictable little creature, best to hop on if it's in. Luke about to transfer to the second pillar. As I write this, pretty much everything from the level of his helmet on down is covered in snow. More guiding and a heck of a lot of snow kept me away from Lee Vining for a few more weeks. When I returned I found myself bulldozing a trail up to Chouinard Falls for two father and son pairs. It's always fun to observe family groups in action (particularly when it's not your own) and watching these two generations encourage and teach each other was pretty cool. As we hiked through the Narrows I was thrilled to see that the left side was thick with ice, even more than it had been a few weeks before! The whole drive home I schemed about who I could drag out there with me. The Narrows left side about 3 weeks after the possible first ascent of Womp Rat, and after the first round of our January snowpocalypse. Jess warming up on a very Scottish TK421. You can see where I tunneled through the snow at the top. Once again my wonderful wife obliged. After a very snowy warm up we crossed over to the left side of the Narrows. A trio of older gentlemen was running laps on a fat looking Zippo's Frozen Booger, So we proceeded up Womp Rat, which was fatter than on the first ascent. Then we climbed a slightly easier yellow and gold colored icicle just to the right. I haven't found any record of this one, and it seems even more rare than Womp Rat, which I thought of as a rare route. We named it C3PO for it's color. At some point in late December Viren Perumal climbed the thicker, bluer flow to the right. It starts in a right facing corner and can be seen forming in Chris' photo above. Since it's right next to 3PO and it's blue he's calling it R2D2. A week or two ago I saw a photo of a climber in the Narrows on Instagram. He mentioned R2D2 in the caption, so I guess the word is getting out! It's a small community of serious ice and mixed climbers here in the Eastern Sierra, and when all this stuff was starting to come in I was communicating with Chris about whether his rig was in fact a first ascent or not. I think the truth is, who knows. Many climbers more talented than I have visited Lee Vining Canyon over the years. Many of the canyon's early first ascensionists didn't even see fit to name their routes and most only acquired names to distinguish them in conversation. That being said, I've seen Zippo's form a few times but didn't even know that ice ever came down where these new routes are, never mind enough to climb. This makes me suspect that they are way more rare. I think posting routes like this on Mountain Project and claiming the first ascent is okay, as long as we're open to the possibility that our ascent isn't the first. If some other climber came first, putting the route information out there in public might even give us chance to get that story and find out a bit more about the history of this cool arena. If you know anything about early ice and mixed ascents in Lee Vining Canyon please contact me.